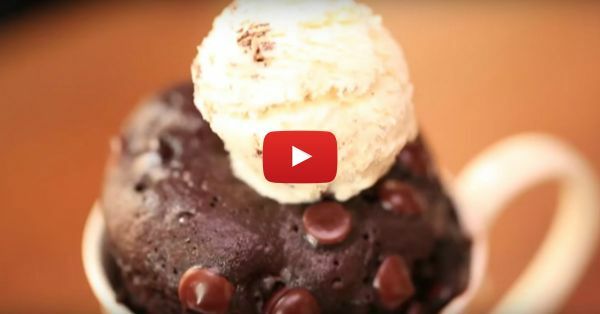 Cake In A Mug: How To Make A Super Quick & YUMMY Dessert! Cake in a mug? Yes, you heard that right, it is possible to make a cake in a mug! So, the next time you find yourself craving for a really yummy cake, try this! It is the tastiest and the easiest thing you can make in your kitchen. Watch this video and just follow the super easy step! What You Will Need: Egg, oil, vanilla essence, milk, flour, cocoa powder, sugar, baking powder Difficulty Level: Easier than making maggi! Watch the video now! Step 1: Mix one egg, 2 tablespoons oil, ½ tablespoon vanilla essence and 2 tablespoons of milk. Whisk together Step 2: Add 3 tablespoons of flour, cocoa powder and sugar respectively along with ¼ tablespoon of baking powder. Also watch: If You Are A Sister – You’ll Relate To EVERY Bit Of This Video! Step 3: Pour the mixture in a mug and microwave for 90 seconds. Step 4: Up the yumminess quotient by adding a scoop of your favorite ice cream and some sprinkles! Also watch: THIS Is What Happens When You Get Home Wayyy Past Your Curfew!